I got this fish from a local petstore that has all of their cichlids mixed together with no id. When I first picked him up as a baby he was white with the black line. He's probably 2" now an has turned a beautiful iridescent color. Its really hard too see his colors in the pics but he's really pretty, green and yellow on his top fin and redsand yellows on his body. 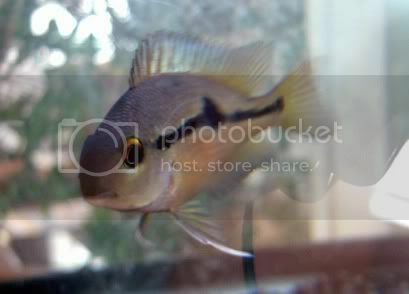 that is not an African Cichlid at all it is a South American Cichlid. I am not sure of the scientific name but i do know that it is called a "Nicaraguian(i can't spell) Cichlid." I am positive that i cannot spell but i am also positive that your fish is a South American cichlid known as "Nicaraguian Cichlid." Thankful to be of service. o and by the way i am not sure how large these fish get but if it is at 2 inches it might be mature.. if the fish is mature in the picture it is definatly a female. i dont know why that appeared twice? He is right...I was way off. matt is right i took a quick glimpse of it and its definetly a nica cichlid. 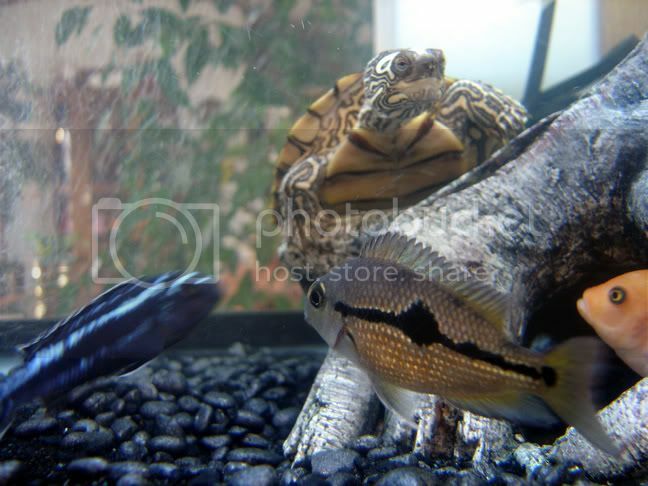 its not very aggressive, and it doesn't get too big either, but whatch out for that red ear slider. thats not a red eared slider. it is not a texas cichlid. i have one of those and thats not what it is!! and that orange one is either a red-devil or midas cichlid.